This PR adds warning messages to the debug window in -disablewallet mode. An alternative approach is to extract the existing alert from the OverviewPage and add that to the QMainWindow. In addition you could try to use addDockWidget(Qt::TopDockWidgetArea, alert_widget). Anyway, my point is to avoid duplicate code. No need to touch the headers. No conflicts as of last run. @promag Thank you for your review. In that case warning messages will be exposed not only on Overview tab but on Send, Receive and Transactions tabs too. Can such behaviour be annoying for a user? Can such behaviour be annoying for a user? Rebased on top of 3e21b69. ... you could try to use addDockWidget(Qt::TopDockWidgetArea, alert_widget). By design, a QDockWidget consists of a title bar and the content area. An alert label can be placed to any of these elements of alert_widget. The other element (without the alert label) cannot be hidden, unfortunately. In addition, such implementation should handle resize events properly that adds some new code and possibly introduces new GUI-related bugs. @Sjors would you mind reviewing this PR? I don't mind the slight duplication of view code. 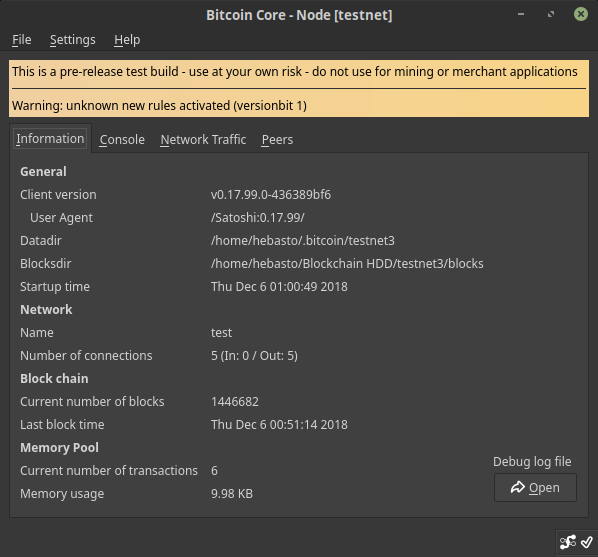 The Overview tab is the first thing you see when you launch Bitcoin Core, so I don't see the point in showing warning in other places. That's especially true the first time you launch the app, so everyone will have seen that it's not a release build. The only exception I can think of is when you open a BIP21/70 URI, so maybe some really critical warnings could also be on the send screen, but currently the warnings, e.g. "new version bit" aren't informative enough for that to be useful. Thank you for your review. All your comments have been addressed. re-tACK c0c9613 assuming Travis is happy (I just restarted two instances, they seem to have been confused by cached code, I noticed that locally too). After merging #15101 the <qt/walletmodel.h> header gets required even with --disable-wallet. @fanquake would you mind reviewing this PR?